Scintillometry is a method that quantifies surface-atmosphere exchanges at the landscape scale (Hill 1992). This scale is particularly adapted for hydrological and continental climate feedback studies. First of all, scintillometry allows to « erase » the fine variability associated with land-use discontinuities and local advection phenomena. It is also consistent with the kilometric spatial resolution of currently available satellite systems offering a daily revisit (AVHRR, MODIS) compatible with the objectives of monitoring the functioning of surfaces. Finally, scintillometry bridges the gap between the networks of local ground stations (demanding in terms of maintenance and monitoring) and the airborne means, which are heavy to implement, representative of higher scales, and moreover incompatible with a continuous monitoring. Scintillometry is based on the intensity fluctuations – and possibly of phase – analysis of the received signal emitted by a transmitter at a given distance (from 100 metres to some kilometres). The observed fluctuations come from the variations of the refractive index encountered along the path of the signal in the atmosphere (depending on the wavelengths used), and thus inform on the characteristics of the turbulence and ultimately on the integrated heat fluxes. This phenomenon of scintillation is frequently observed during the day above hot surfaces when the horizon begins to “dance,” or at night when contemplating the celestial vault. For wavelengths of signals emitted in the visible and near infrared, scintillation essentially depends on the temperature fluctuations of the air between the transmitter and the receiver and makes it possible to estimate the sensible heat flux (see WP1.2). For microwaves, scintillation is sensitive to fluctuations in temperature and humidity. The use of two scintillometers in two different wavelengths makes it possible to deconvolute the effects of each variable and to estimate the sensible and latent heat fluxes. Within the framework of WP1.1 of CRITEX project, a prototype of a 94 GHz microwave scintillometer was produced by LTHE and the Rutterford Appleton Laboratory (UK), which specializes in the development of remote sensing instruments, particularly in the radiofrequency domain. The microwave scintillometer was installed on the Orgeval basin (Figs 2 and 3, (ORACLE observatory, Ile-de-France)) to implement the signal analysis procedures. It is operational and acquires data in kHz continuously since 11/03/2016. 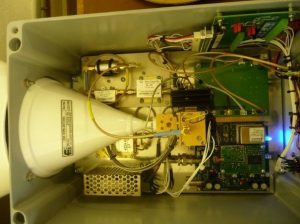 On the one hand, these very high frequency data make it possible to extract a clean signal using digital filters and on the other hand to qualify the data. The inversion procedures allowing the passage of the raw data (variance of the received signal) to the physical data that are the structural parameters for the refractive index of the air Cn², the temperature CT², and the specific humidity are in the finalization phase. Conversion to hydrological data of interest (ETR) is underway. 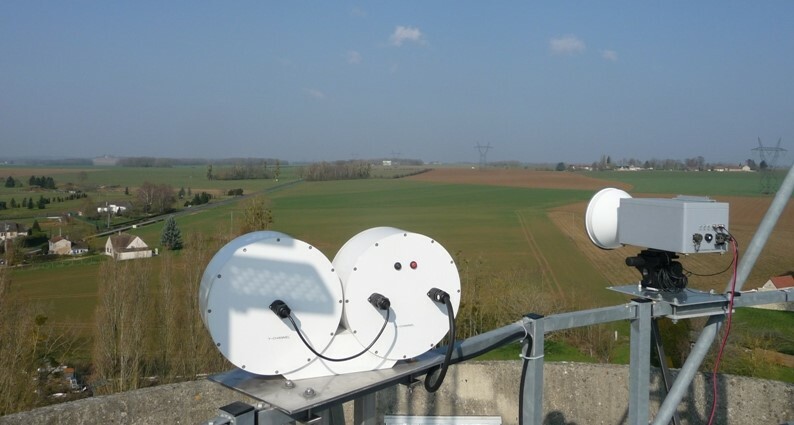 Figure 3: Footprint of the scintillometers between the Doue hill (left) and the Rebais water tower (right) for day conditions (sensitive flow: 200 W/m²). Each iso-contour represents respectively the 10%, 30%, 50%, 70% and 90% contributing area to the measurement. Figure 4 presents 5 days of inverted signals representing the structure parameters for temperature and specific moisture which allow to evaluate the sensible heat and latent heat fluxes. 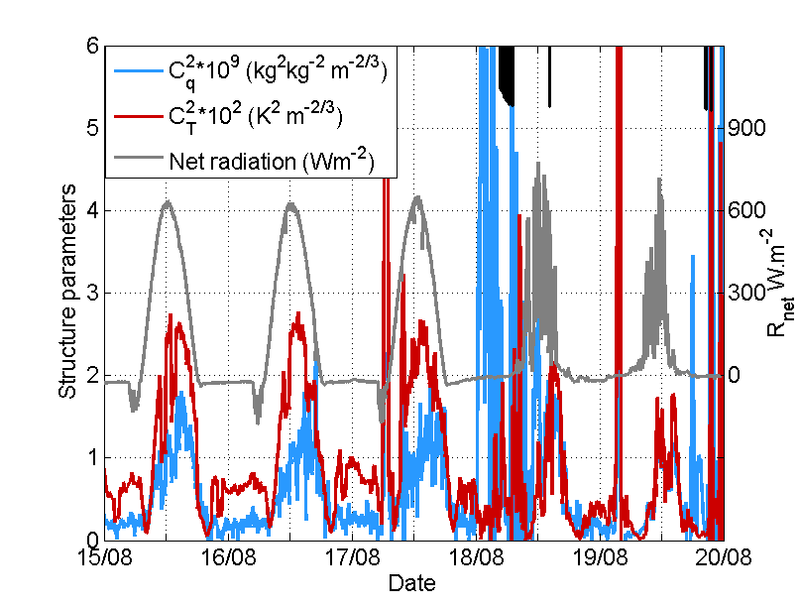 From 15 to 17 August 2016 the days were very sunny on the Orgeval (curve of the net radiation). The CT² signal after scaling has a greater dynamic than the Cq² signal. The rain of August 18 (~ 6mm) disrupts the inversion, and during the following days Cq² and CT² have a similar dynamic. The decrease in available energy leads to a decrease in the convection and turbulent activity observed by the scintillometers.